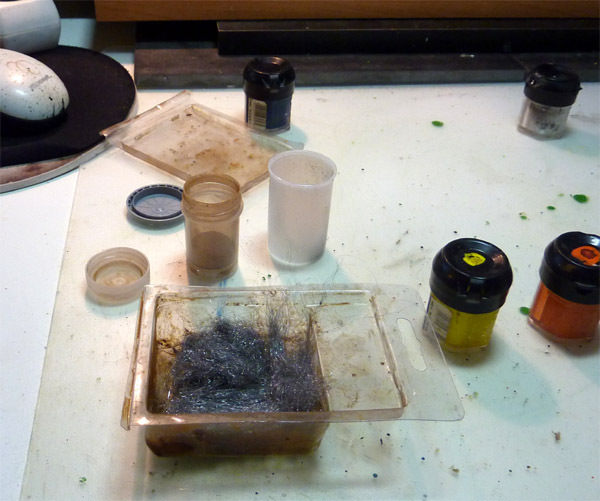 I just want to show you here how you can create your own rust pigments for your miniature weathering. Put steel wool in the container, put water in it. Bring water in as high that the wool is completly under water (i am saying more to this later on). 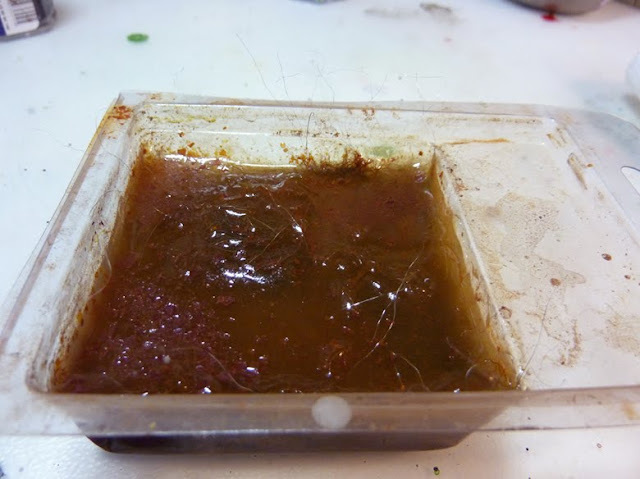 Next wait for about 5 days or something around that until the water did disappear by air and the wool did rust to dust - now you have rust pigments which are best stored in a small container which you can close. If you don't put enough water in your container, while the steel wool rusts in parts there will be little pieces in the end when the water has disappeared, but you know also this can be intresting. Take care when bringing them up. 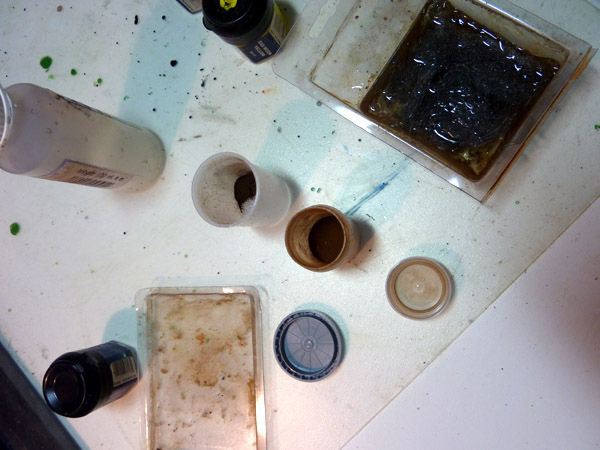 You can do a glaze of pigments and they will dry out dusty again (good for tanks for examples or to only bring them to lower areas on your model), for sure you can use them massive on a base for example or mix them up with something else you'll find while having a dirty moment at your workbench. Trust me, they will dry out as they had been before again - dusty and rusty. Another way to bring them up is dry with an old dry brush getting them up and dab them up your place of wish. It will change this area, bringing a dusty subtle touch to it. If you brought them at place and go over it with a liquid wash of something you want to bring on the area because the muse says so, then be warned, the rust works again, when being confrontated with water again - just get it on with some experiments. Another tip while preparing your own real rust is to have multiple containers. One for the normal use of this procedure, another one for having water mixed with some colours for example to make greenish rust. Ok, enough - it is up to you to get it on. Before you "drown" your steel wool it´s important to wash it with soap. Wear some gloves while doing it, cause the nasty steel wool will byte you, at least it feels like it ;-). When you use pure Vinegar or even "Essigessenz"(german word)it works much quicker. I tried this and there was a large amount of black junk mixed in with the rust. Any idea what that might be, and what I could do differently? One thought I had was that it might be carbon from the steel, but Wikipedia says that steel wool is made from low carbon steel, and you didn't seem to have the same problem. Perhaps my steel wool came with oil from the manufacturing process, and I should have washed it first. I'll try that next time, and see if I get better results. Hm my steel wool seems not to rust at all at the momment...it only starts to get black here and there, where the water has dried and let some fresh air in touch with the steel wool. Did you do anything else before pouring the water in, or use any adhesive? Ok... i am also having some minor problems. It is getting dry and dark at several places. I've asked the ultimate Chapuchin guy and he said it would be good to bring some vinegar (germ. Essig) to it in the start, that smells a bit but helps make the steel wool rust faster and the pigments more fine in the end. 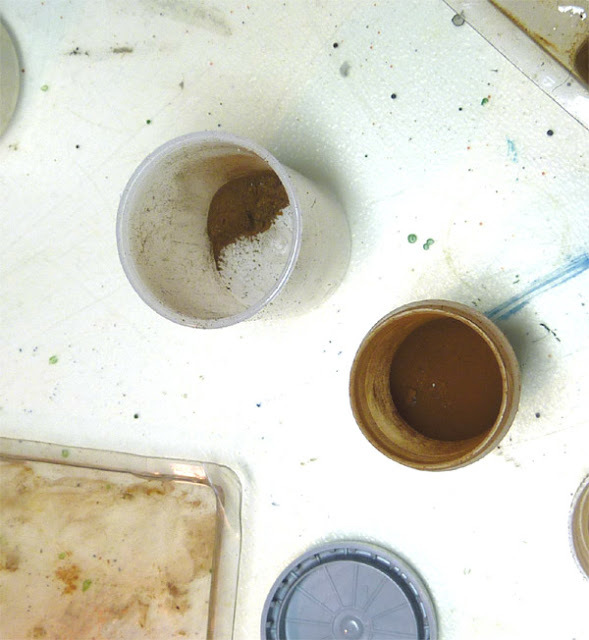 In my case where it is now really dry i just crushed the rests into small pieces, pigments by using a plunger (germ. Stößel). Hope that helps... will be updating this article soon. Muchas Gracias... May i quote you in the tutorial if this is fine with you? Thank you very much :) - it is done. 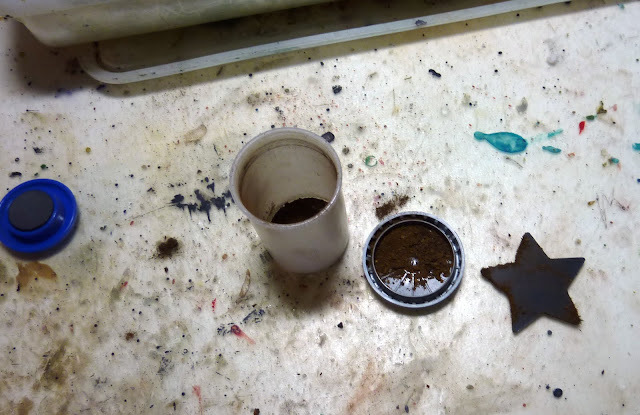 When you filter the rust from the rest, which part sticks to the magnet?